Recently, the well-known watchmaker Gevril has released a new model Corsaro Chronograph brand GV2. Gevril is a watch company, which started producing models in 1743. Established employees Gevril GV2 brand over the past few years not so far advanced in the successful conquest of the market hours. However, this does not interfere with employees to make new efforts to create inexpensive mechanical models. 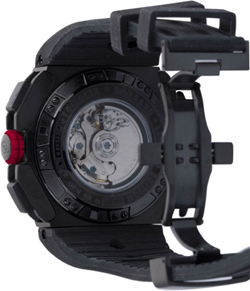 The company announces the release of new products under the name of GV2 Corsaro Chronograph. The body of the model is made of steel and has black elements with an ionic surface. The case is quite large, its diameter is 50 mm and thickness – 17.5. Its new product the company is positioning Gevril as a “courageous and strong” model. The magnificent chronograph dial features black and burgundy, which is three counter chronograph with Tag “12:00”, “6:00” and “9:00.” In the center of the dial and the seconds hand is red. We mark time “3:00” is a large aperture of the date and day of the week. It protects the dial sapphire crystal. Model GV2 Corsaro Chronograph was made in Switzerland and is equipped with a mechanism Technosablier SEDD3C6912. Water resistant innovations – 100 meters. 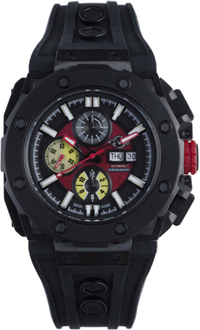 Buy Watches GV2 Corsaro Chronograph is possible for $ 5495.